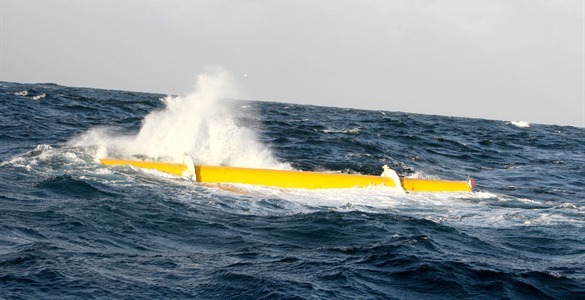 The Oyster™ 1 was essentially a wave energy converter located at a nominal water depth of 12m which in many locations is relatively close to the shoreline. The system comprised of a buoyant flap, 18m wide and 10m high, hinged at its base to a sub-frame which sat on 4 pre-installed piles with additional latching anchors into the rock seabed. The surge component in the waves forced the flap to oscillate which in turn compressed and extended two hydraulic cylinders mounted between the flap and the sub-frame to pump water at high pressure through a closed loop pipeline back to shore. On shore a hydro-electric plant consisting of a Pelton wheel turbine driving a variable speed electrical generator coupled to a flywheel. Power flow was regulated using a combination of hydraulic accumulators, an adjustable spear valve, a flywheel in the mechanical power train and rectification and inversion of the electrical output. The device was installed at European Marine Energy Centre (EMEC) wave device test area in Billia Croo, Orkney. Oyster 1 delivered over 6000 offshore operating hours, survived two winters at sea and performed in line with predictions made from our design model. Oyster 1 also achieved continuous 24 hour generation and successfully demonstrated the feasibility of using wave energy to pump high pressure water to an onshore hydro-electric turbine to create electricity. Oyster 1 generated significant operational experience, learning and data which have fed into the design of Oyster 800. The Oyster 1 device was built with a two year design life and operated from 2009 until 2011. In March 2011, Orkney Towage & Leask Marine took advantage of calm weather conditions to decommission the device in preparation of the second generation design of Oyster 800. Baseline studies for the Billia Croo test site were performed by EMEC and can be found here. All of the key environmental issues considered in the Environment statement were assessed as insignificant impacts. Oyster 1 at EMEC is located in United Kingdom.